rec. Sello Concert Hall, Espoo, Finland, 6-9 June 2007. DDD. 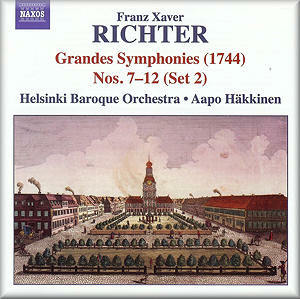 This completes the Naxos recording of the twelve Sinfonias or Grandes Symphonies which F X Richter composed around 1740 and published in Paris in 1744, the first six of which appeared on 8.557818. Tim Perry welcomed that first volume: “If you have any interest in “big C” Classical music, you will enjoy this disc” – see review. I came to this CD straight after listening to some of the Haydn symphonies on Volume 4 of the Nimbus Austro-Hungarian Orchestra/Adam Fischer series (NI5683-7), a pretty hard act to follow. How would the Richter recording stand up against the competition? In fact, neither the music nor the performance are put to shame by the comparison and the recording is very good, too. Richter may not be quite as endlessly inventive and varied as Haydn and the Helsinki Baroque Orchestra not quite as light on its toes as the Austro-Hungarian players, but the music is very enjoyable and the performances are very good. These symphonies predate Richter’s arrival in Mannheim in 1746, so they don’t provide examples of what came to be known as the Mannheim Rocket or Steamroller, though there’s plenty of drive and energy in the outer movements. There’s plenty of tenderness, too, in the slow movements. The outer movements of Symphony No.27 (tracks 14-16) contain plenty of g-minor drama – somewhat reminiscent of Vivaldi at his most impassioned. For a composer who had been raised on the theories of Fux in his Gradus ad Parnassum, and whose own treatise Harmonische Belehrungen leans heavily on the earlier composer, his music is surprisingly advanced for the 1740s. Allan Badley’s notes, like the articles in the Shorter Grove and the Oxford Companion to Music, describe Richter’s music as conservative in style by comparison with that of his Mannheim contemporaries and heavily reliant on counterpoint, so his music is closer to J S or C P E Bach than to Haydn and Mozart. In the event, however, if I’d turned on Radio 3 and tried to guess, I’d have placed the music rather later than 1740, with its elements of the baroque, galant, and even some elements of the classical styles. Recent scholarly editions, by Allan Badley, who has also written the notes, and published by Naxos’s associate, Artaria, are employed. I can’t improve on TP’s description of the Helsinki Baroque Orchestra under Aapo Häkkinen as a bit of a find and a world-class period ensemble. I hadn’t heard them before; I very much hope that more of their recordings come my way. The ensemble is small – 4+4 violins, 2 violas, 2 cellos and double bass. It appears that two keyboard instruments were employed for the recording; as well as the one from which Häkkinen presumably directs, a second is listed. The Naxos recording is close but not too close. It even allowed me to hear the harpsichord in places, the lack of which has been one of my recent complaints about several recordings. I don’t want it in my lap – it isn’t here – but I don’t want it to be so discrete that I can’t hear it. Allan Badley’s notes are scholarly and readable and the presentation is up to Naxos’s usual high standards, even if the cover picture of Mannheim is slightly inappropriate for music composed before Richter got there. I certainly intend to obtain the earlier Naxos CD now. There’s another recording of Richter’s music in the excellent Chandos Contemporaries of Mozart series (CHAN10386), with which David Blomberg was impressed: “These pieces warrant more frequent performance on stage and the case for these pieces is extremely well put across by the London Mozart Players” – see review. Miraculously, that recording, of Symphonies Nos.29, 43, 52, 53 and 56, does not overlap at all with either of the Naxos CDs. I hope to include a review of it – and of the earlier Naxos CD – in a forthcoming Download Roundup.